The 4-inch CFLs include 13- and 18-watt models. The thermally protected, fused, 120-volt electronic ballast provides full light output and flicker- and noise-free start-up and operation. The lights feature a 4-inch aperture size, which facilities use for accent, task, and perimeter-area lighting. 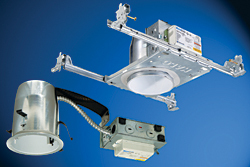 The housings are designed for insulated ceilings.